Map showing general Nautilus operating areas for 2016 expeditions. Image courtesy of the Ocean Exploration Trust. Download image (jpg, 98 KB). On May 10, 2016, the Ocean Exploration Trust embarked on a four-month expedition aboard Exploration Vessel (E/V) Nautilus. 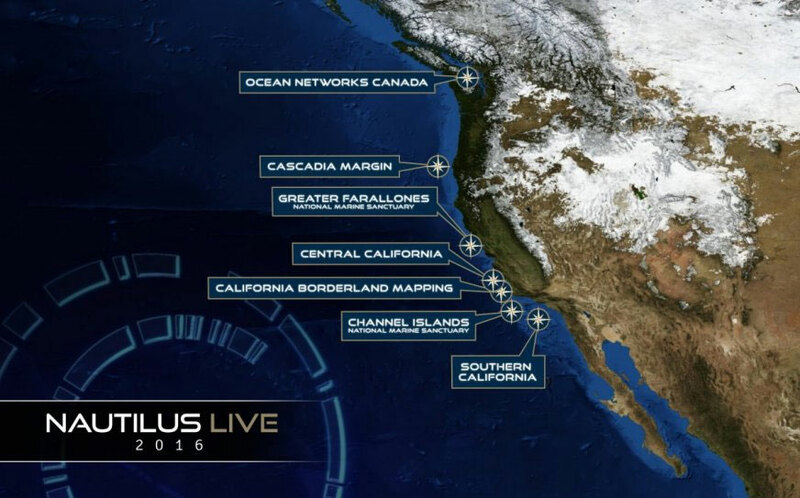 In its second year of exploring the eastern Pacific Ocean, Nautilus visited sites from British Columbia and along the west coast of North America down to southern California, including regions within several national marine sanctuaries. The NOAA Office of Ocean Exploration and Research provides support for the complementary ocean exploration program of Nautilus, which operates under a similar paradigm as NOAA Ship Okeanos Explorer. By collaborating on mission plans, NOAA and the Ocean Exploration Trust are helping increase understanding of our largely unknown ocean, illustrate the value and importance of ocean exploration, and develop the next generation of ocean explorers. Throughout the Nautilus field season, you can follow discoveries and interact with scientists live via the nautiluslive.org website, putting the unexplored ocean directly into your hands. 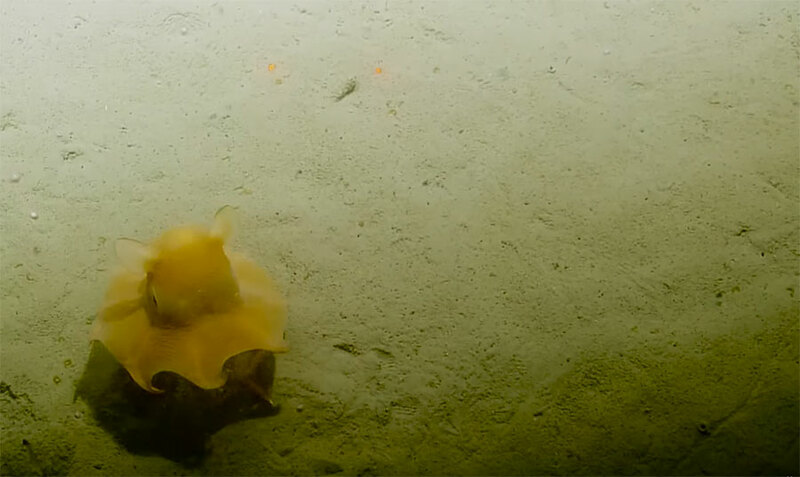 Follow the LIVE seafloor video and send in your questions to scientists on board on nautiluslive.org and stay tuned to Facebook and Instagram at NautilusLive , and on Twitter as @EVNautilus for updates. A yelloweye rockfish rests at the base of the rusted hull of the SS Coast Trader shipwreck, while Oregon hairy tritons dangle above. For scale, the two red laser dots are 10 centimeters apart. Yelloweye rockfish have been documented as living to 120 years old, so some of the large adults observed on the wreck could have been alive when the ship sank. Image courtesy of the Ocean Exploration Trust. Downlaod image (jpg, 103 KB). 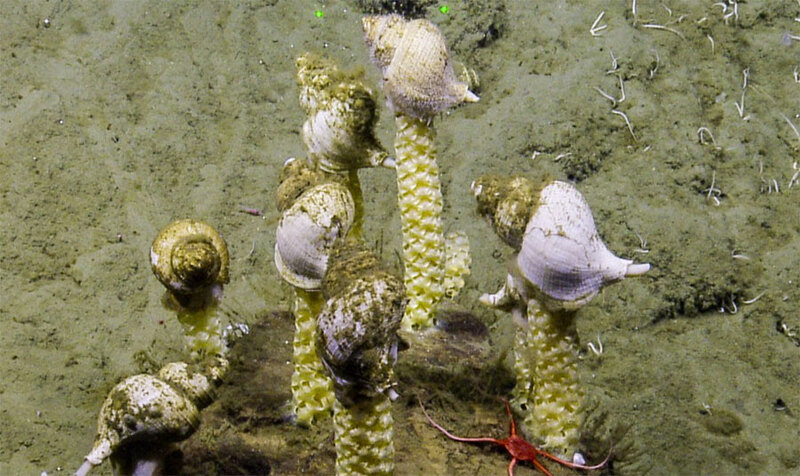 On this expedition, scientists explored for methane seeps and associated ecosystems along the U.S. Cascadia continental slope, located off the U.S. West Coast. Although there have been detailed studies of selected methane seep sites on the Cascadia margin, such as at Hydrate Ridge, and on the lower slopes off central Oregon, the Cascadia Margin has not been systematically surveyed for methane seeps. Using new water column multibeam survey technology on the Nautilus allowed researchers to map water column bubble plumes rising from the more vigorous seep sites. Discovery of new seep sites could open up new avenues of research and could also help to better frame the issue of increased methane release into the upper ocean. During this cruise, Nautilus also explored the wreck of the World War II freighter SS Coast Trader, located just outside Olympic Coast National Marine Sanctuary, in Canadian Waters. The remotely operated vehicles (ROVs) conducted the first visual survey of this cultural heritage site as well as assess its condition and remaining vessel stability. Scientists explored, for the first time (by deep submergence vehicle), the unique geological features that define the jagged rim of Quinault Canyon within Olympic Coast National Marine Sanctuary on the Washington continental slope. Recent sonar mapping shows rock ridges, relict Pleistocene sediments, and reflectance from non-geologic formations that may indicate rich habitats for coral and sponge communities. Live underwater video provided the first glimpse of the unexplored Quinault Canyon. View photos of the SS Coast Trader shipwreck and animals found inhabiting the wreck, or life in Astoria Canyon . View data collected during this expedition. Octopus seen during the expedition; video available here . Image courtesy of the Ocean Exploration Trust. Download image (jpg, 68 KB). 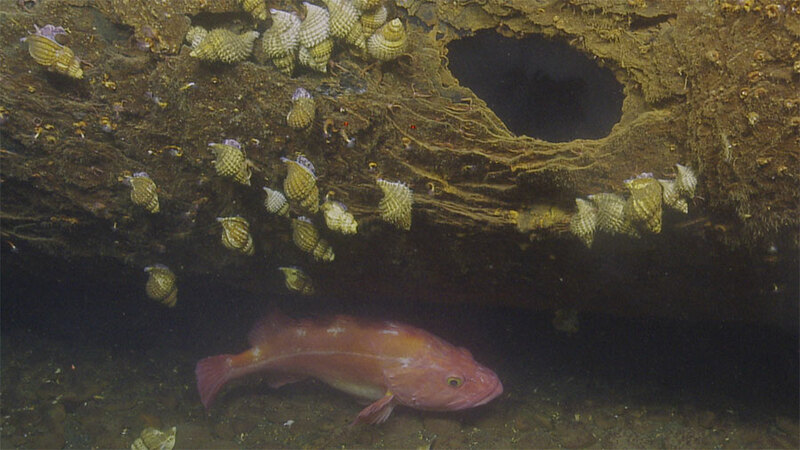 This expedition focused on exploration of underwater canyons off the coast of California, including hardground communities from Bodega Canyon in Cordell Bank National Marine Sanctuary south to the Point Dume, diving on canyons, rocky banks, terraces, and seamounts to survey the unique corals, sponges, and sea life that inhabit these zones. Scientists also explored oxygen minimum zones along the Santa Barbara Basin and Channel Islands coastlines in order to study past climates and learn more about the animals adapted to these ecosystems. During this cruise, Nautilus revisited a very large methane seep site initially mapped and characterized by the Corps of Exploration during the 2015 expedition. The ROVs imaged extensive orange, white, and grey bacterial mats, clam beds, and seeps within the oxygen minimum zone last year. The team returned to use sensors to geochemically map the seep site. This expedition included dives on Davidson Seamount in Monterey Bay National Marine Sanctuary, which is known to host coral and sponge communities. Watch a video overview of the expedition. A rare sighting of whelks building egg towers. During dives in the Channel Islands National Marine Sanctuary, scientists came across vast fields of these egg towers in huge numbers. Image courtesy of the Ocean Exploration Trust. Download image (jpg, 141 KB). During this expedition, scientists collected high-resolution bathymetry and sub-bottom profiling data to characterize the seafloor in unmapped areas within Channel Islands National Marine Sanctuary. Following mapping operations, remotely operated vehicles were used to make observations, collect high-definition video imagery, collect biological and geological samples, and ground truth the newly collected multibeam data. Scientists also surveyed geological and geophysical aspects of the region; made new observations about the structure and nature of tectonic faults, ridges, seamounts, and basins; and worked to identify, characterize, and sample unmapped and unexplored features such as oxygen minimum zones, gas seeps, marine terraces, paleoshorelines, hardbottom habitats, and their associated benthic ecosystems. Mapping, exploration, and discovery of deepwater habitats will provide data needed to better manage and protect the resources within the Sanctuary. View photos of some of the unusual discoveries made during the expedition and other corals and critters seen in the sanctuary . 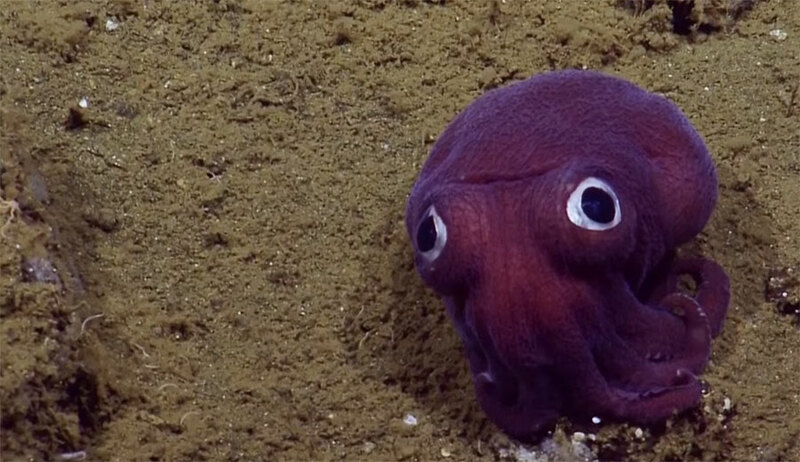 During the expedition, the team spotted this Stubby Squid off the coast of California at a depth of 900 meters (2,950 feet). The stubby squid (Rossia pacifica) looks like a cross between an octopus and squid, but is more closely related to cuttlefish. Watch video of the squid. Image courtesy of the Ocean Exploration Trust. Download image (jpg, 107 KB). This 20-day expedition involved the investigation of the offshore Southern California margin, a broad area that fits entirely within the U.S. Exclusive Economic Zone but that still remains largely unexplored. The margin has been investigated for over 50 years, but less than half of the area has been mapped in high resolution. Mapping operations and remotely operated vehicle dives conducted during the expedition will provide insight into the biology and geology of the area, including marine slides, seeps, mud volcanoes, and subtle fault scarps. This information may help in managing oil and gas resources off the coast of California; yielding insights into past climate changes; and assessing natural hazards such as earthquakes, landslides, and tsunamis. Bow of USS Independence, seen for the first time after 65 years. Watch video highlights from the dive. Image courtesy of the Ocean Exploration Trust. Download image (jpg, 84 KB). Nautilus returned northward along the California coastline for a cruise to study the cultural heritage and natural wildlife in the Greater Farallones National Marine Sanctuary (GFNMS). GFNMS contains over 400 shipwrecks and is largely unexplored in the deepest portions. 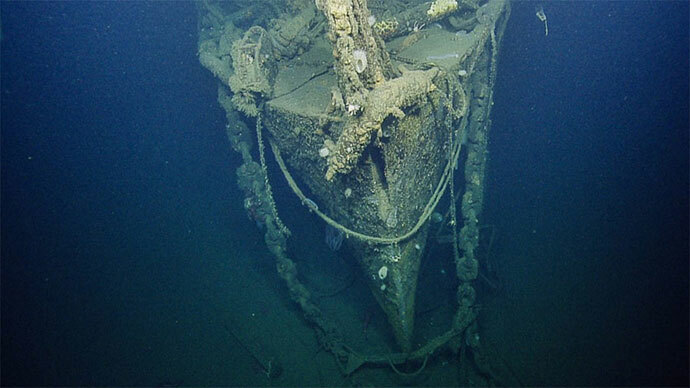 Scientists conducted the first visual survey of the USS Independence, a World War II-era naval ship and former aircraft carrier scuttled offshore of San Francisco in 1951 and rediscovered as the deepest shipwreck in GFNMS. Two other shipwrecks, the Ituna, which was an historic steam yacht from 1886, and the freighter Dorothy Windermote, were also be explored. While in GFNMS, an additional goal of the cruise was to characterize habitat of deep-sea corals and sponges. These habitats will be prioritized for future research as they serve as sentinel sites for ocean acidification monitoring and identification of impacts within an upwelling region. This expedition will contribute to the baseline understanding of fish, deep-sea coral, and rocky substrate communities within GFNMS. View additional photos of the USS Independence . For the final expedition of the 2016 field season, Nautilus worked along the California Borderland region offshore San Diego to San Francisco. Scientists collected high-resolution mapping data along this complex margin within America’s Exclusive Economic Zone, of which very little of the seafloor has yet been extensively mapped. The partnership between the NOAA Office of Ocean Exploration and Research and the Ocean Exploration Trust has been an evolving one, tracing its roots back to 2000. NOAA Ship Okeanos Explorer was developed alongside E/V Nautilus, allowing the sharing of telepresence technology to bring the wonder of ocean exploration from ship to shore. 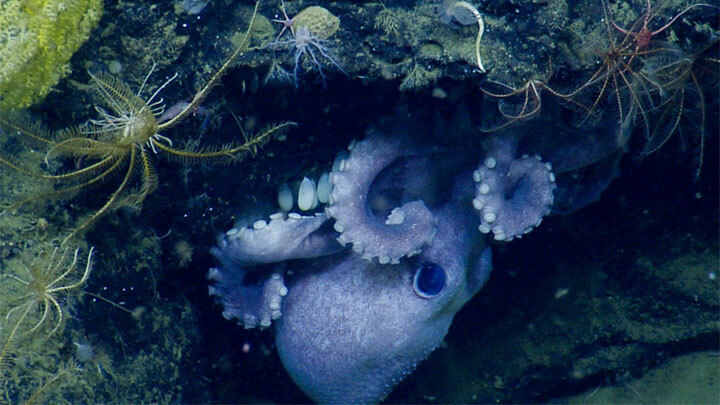 In addition to providing funding support for the Nautilus mission, the Office of Ocean Exploration and Research continues to work with the Ocean Exploration Trust to advance technology and reduce uncertainties in critical parts of our largely unexplored deep ocean.